We are so pleased to bring you the work of our good friend and Roycroft Master Artisan, Laura Wilder, presented here in Dard Hunter's quarter sawn white oak frames. For her giclee (pronounced "jhee-CLAY") prints such as Pine Woods I, Laura first creates an original painting; which is then reproduced with a high-quality digital printer, with archival and light-fast inks on high-grade paper. The high-resolution image is then hand-signed and numbered, mounted into ebony-colored archival mat board and framed per your selection. 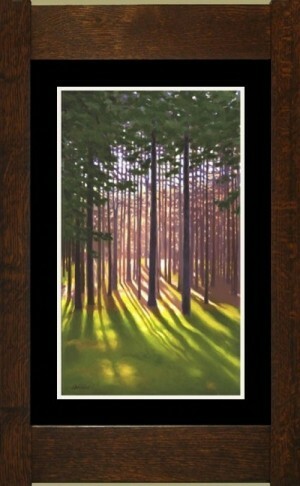 Pine Woods I measures 15.5" x 24" matted; and once it is framed with a mortise and tenon style frame in our own Signature finish (as shown) it measures 19.5" wide x 29" high.